These standup comedy classes are conducted by award-winning, comedy director, writer and founder of the American Comedy Institute, Stephen Rosenfield. The class meets a total of eight times: five group classes, two private writing sessions, and your performance at Gotham Comedy Club, New York’s premiere comedy club. In the eighth class there is a screening during which you and your fellow performers will see your show on video. Following the screening of your show, Stephen shares his expertise on how to pursue a professional career in comedy – how to start performing in the comedy circuit, how to get booked in clubs, and how to get agents and managers. Stephen’s ability to bring out each performer’s own, individual comic voice is a reason that his students are performing and headlining in every club in N.Y. and L.A., across the country, and around the world. You don’t need to have written or performed before. All you need is a pencil and your sense of humor. Veteran performers use the standup classes and private coaching sessions on an on-going basis as a means to create new comedy material and to strengthen their skills as performers. The price of the standup comedy classes for returning students is at a reduced fee. The standup comedy classes at ACI are offered every month of the year. Your material will be polished in private writing sessions. In the group classes, your performing skills will be guided and enhanced. When it’s time for your club appearance you will have solidly written, funny material and you will be well rehearsed and ready to perform at your peak and beyond. The classes are offered to both beginners and advanced students. For more information and to get scheduled Contact us at (212) 279-6980. For students who live outside the metropolitan New York area, the standup comedy workshop is offered as a five-day intensive workshop each month. Classes, private writing sessions, and your club appearance are all scheduled within five days. For more information and to get scheduled Contact us at (212) 279-6980. Please note: Tuition is non-refundable. Stephen Rosenfield says that making a career of comedy comes down to two things: “Get good and get seen.” His stand up comedy classes provide students with the opportunities to do both. By providing direction to their performing and writing, plus on-going opportunities to perform at such major clubs as Gotham Comedy Club, he creates the opportunity for his students to be seen and well received by industry professionals. Our students have performed standup on The Tonight Show starring Jimmy Fallon, Conan, Jimmy Kimmel Live!, The Late Show with David Letterman, The Nightly Show with Larry Wilmore, The Late Late Show with Craig Ferguson, Lopez Tonight, Comedy Central, HBO, NBC, CBS, FOX, Netflix, PBS, OWN, Bravo, FX, Starz, MTV, VH1, JLTV, Televisa and Univision. Among the TV shows in which they appear in starring and principal roles are: Saturday Night Live, Girls, The Daily Show, Inside Amy Schumer, Louie, Portlandia, Key and Peele, Orange is the New Black, Silicon Valley, The Jim Gaffigan Show, Boardwalk Empire, Broad City, High Maintenance, The Office, 30 Rock, Fargo, Girl Code, The Jack and Triumph Show, Wanda Sykes Presents Herlarious, Royal Pains, Es De Noche y ya Llegue, Enlisted, I Love the 1880’s, Rescue Me, Flight of the Conchords, Last Comic Standing, Gotham Comedy Live, The Chris Rock Show, My Boys, That 70’s Show, 24, Ellen, and Seinfeld. They have appeared in such films as Ghostbusters, The Comedian, The Heat, This is 40, It’s Kind of a Funny Story, Morning Glory, Away We Go, Mascots, Happy Christmas, The Love Guru, Love Actually and 13 Going on 30. Stephen Rosenfield’s standup comedy classes culminate in a performance at Gotham Comedy Club, New York City’s premiere comedy club. 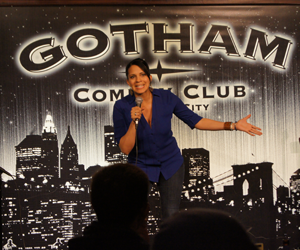 Gotham Comedy Club has launched the country’s greatest and best comedy talent. 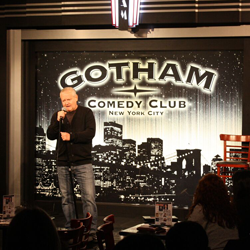 Your performance at Gotham Comedy Club will be a prime time weekend spot–a great place and the best time to invite your friends and family. To relive your triumph, you can purchase a video of your standup comedy performance and have it posted on YouTube. Once you complete your first standup comedy class, you are eligible to perform in the American Comedy Institute Vet Shows at Gotham Comedy Club. These standup comedy shows, scheduled twice a month, provide you with on-going, quality stage time. Does the thought of performing make you nervous? Good. This is the healthy response to the prospect of being on stage. Professional comedians have learned to use their nerves to enhance their performance. Stephen Rosenfield’s standup comedy classes will teach you how to do this. View all classes and services and find a time and service that works for you. Our most immersive program, this teaches all aspects of stand up. Comedy classes designed for teens and kids to find their own humor. Get personal one on one coaching classes with Stephen Rosenfield. From consultation to speaking events ACI provides a multitude of services.